The decision to upgrade your existing property or buy a larger premise was based on whether your current property was over or under capitalised. (Photo: Shuttstock). Cape Town – Upgrading your property depends on timing an interest rate peak as well as knowing if your property is worth an upgrade at all, says a property expert. FNB property expert John Loos said that property owners wishing to upgrade had to wait for the right time. “With interest rates at abnormally low levels, our estate agent surveys have showed an increase in the percentage of sellers that are selling in order to upgrade their properties to round about 20%,” he said. Before you upgrade, you would need to do scenario planning, examining the rates and tariffs bill, as well as studying the increase in maintenance costs of a larger property. The decision to upgrade your existing property or buy a larger premises was based on whether your current property was over or under capitalised. “If you are the smallest house and perhaps the cheapest house and the least frilled house in the area, and around you are double story houses … we would probably say you are under capitalised relative to the area that you live in,” he said, which means that upgrading that property would result in a satisfactory increase in value. Conversely, he said, if you were living in a low-income area, where all the properties were small, then upgrading to a larger estate with swimming pools and tennis courts would be highly unwise as that would be over capitalising on the property. “You would find it very difficult to sell your house one day,” he said. With interest rates at abnormally low levels, our estate agent surveys have showed an increase in the percentage of sellers that are selling in order to upgrade their properties to round about 20%. 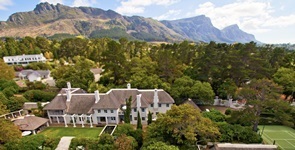 The estate where the late Princess Diana used to holiday is on the market in a sought-after suburb of Cape Town. An FNB estate agent survey shows that about one in four home sales are being generated by middle-aged owners seeking to move to a smaller, more secure property.